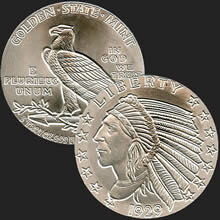 The rounds in this Incuse Indian Collection have a design that almost all collectors will recognize and treasure. 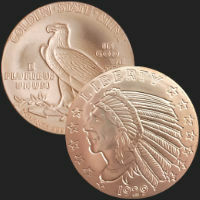 First used in 1908, the design is quite different from previous pieces. 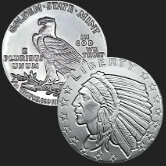 The incuse, or sunken design that was first adopted by William Sturgis Bigelow, and sculpted by Bela Lyon Pratt for the $5.00 and $2.50 Indian Head coins, has a sunken relief design that lies below the flat plane of the round’s field with no raised features or rim. 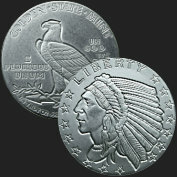 Being recessed, the design elements are shielded from heavy wear. 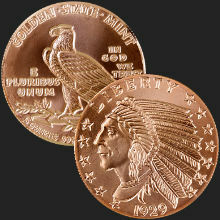 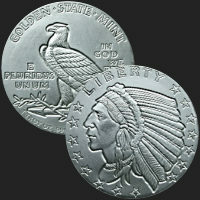 The obverse (front) features the profile of a Native American chief in full headdress, with the motto "Liberty" on the top. 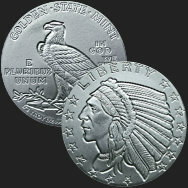 The reverse (back) of each round displays the iconic standing American Eagle, the motto "In God We Trust" on the right, the motto "E PLURIBUS UNUM" on the left, and the inscription "Golden State Mint" along the top. 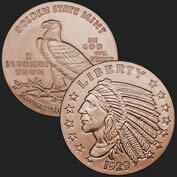 Available in .999 fine silver, .999 fine copper, and .9999 gold, these beautifully crafted rounds add value and art to any collection. 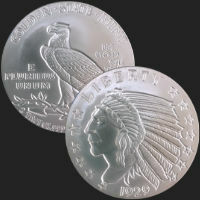 The one ounce silver Buffalo and Morgan rounds my wife and I purchased are magnificent. 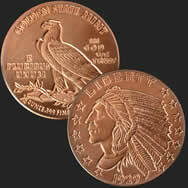 They are of artisan quality, and the price was very competitive. 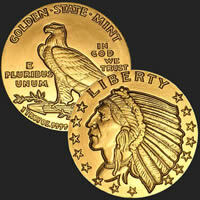 We do not hesitate to recommend Golden State Mint. 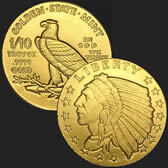 Their quality and prices are exceptional, and their service is outstanding.